Now that we're all aware of Bonificio's family history and his legacy of mezcal production in Santa Catarina Minas, let's talk a little bit about the distillery itself. The Real de Mina distillery was built by Boni's father and grandfather with two clay pot stills and a roasting pit located outside. Up until 2006, when Jake and Jose decided to partner with the family, the mezcal was only sold locally within the village; there was never any serious commercial production. 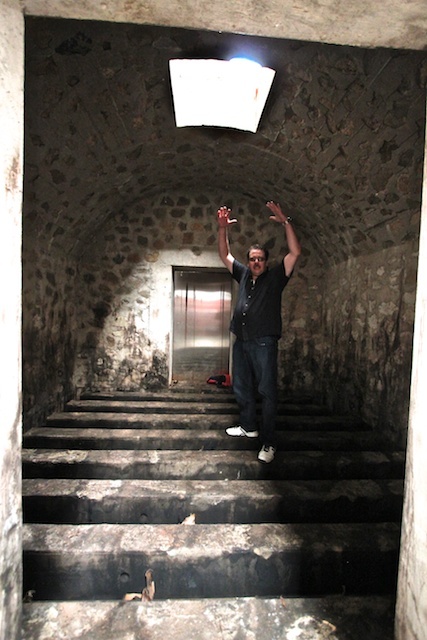 Jake has known the Arellanes family since 1988 when he began studying mezcal as a teenager in region and visiting different producers all over Oaxaca. The spirits of Santa Catarina Minas were his favorite, and ten years later he thought about turning those mezcales into a business. His partner Jose began helping the distillery financially in 1995; sending money to help with repairs in the infrastructure. Today, after a bit of remodeling, the distillery is a more functional and streamlined operation; although there's not much of a difference other than the fact that they've added a bit of modern technology (like an oven and one computer to send emails). All distillation is still done in clay pots, heated underneath by fire, and condensed in a second pot by a stream of cool water that runs from a pipe over the top. There are four stills currently in operation (two located outside) at Real de Mina. After the agave is harvested, it is hacked into large chunks by machete and thrown into a pit lined with large stones placed over hot coals. The pile of piñas is covered with a mound of leftover fibers from the previously-spent agave and then topped with a large canvas tarp to keep the heat in. When the sugars have been sufficiently concentrated, the agave is fed through a custom-designed shredder (a proud personal accomplishment of Jake's) that was engineered to efficiently breakdown the tough, fibrous pulp without stripped the meat of desirable sugars. 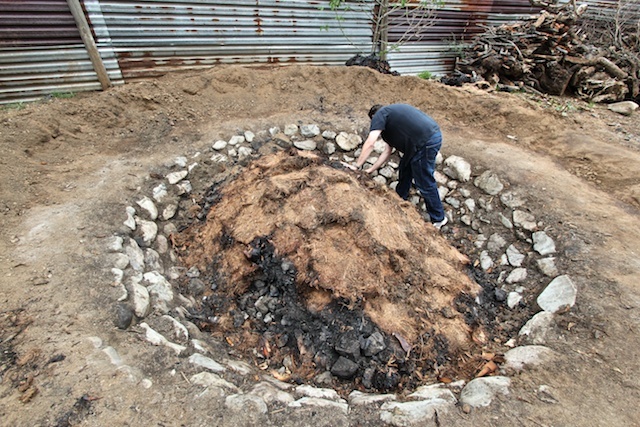 While the old burro y tajon is the more rustic and romantic way to crush agave -- the round stone wheel drawn in a circle by a horse or donkey -- it results in a greater loss of precious azucar. While the agave used for Don Amado mezcal is roasted in the outside fire pit, the agave used for Mina Real is steam-cooked in an internal oven built by Jake a few years ago (with advise from Carlos Camarena in Jalisco). Much like with Islay whiskies, the smoky flavor of mezcal has become the hot booze trend over the last few years, giving the category a much-needed boost against its more refined cousin, Tequila. Jake, however, has spent the last decade trying to temper the smoke from his mezcal and focus more on the flavor of his agave. "You wouldn't add a smoky flavor to wine," he said to me recently, "because it would mask the delicate flavors in the grape itself." He has other motivations besides terroir, however. When Boni's wife passed away eleven years ago from lung cancer, after working in a smoke-filled agave pit for most of her adult life, Jake had a revelation. "Some of these people are being poisoned by all of the smoke being put into the air around here. 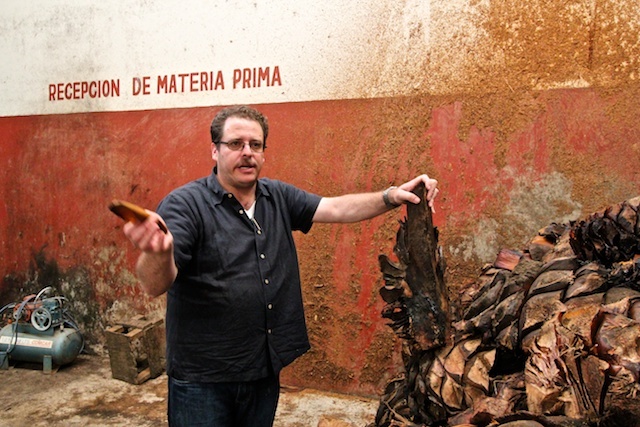 When Boni's wife passed it was the first time I really felt like smoke was the enemy, and it inspired me to find an alternate way to cook our agave." The flavors that result from the two different processes are quite striking. The piñas roasted in the pit taste almost like barbeque sauce, with a smoky, tangy, meaty flavor with lots of sweetness. We chewed several pieces to release the juices onto our palates. The piñas steamed in the internal oven have a much fruitier flavor, and the texture of the agave itself afterward is quite different as well. The agave has almost the texture of a papaya or guava, and the sweetness is much less dominant. The contrast between these flavors represents the main difference between the delicate character of Don Amado and the more savory profile of Mina Real. 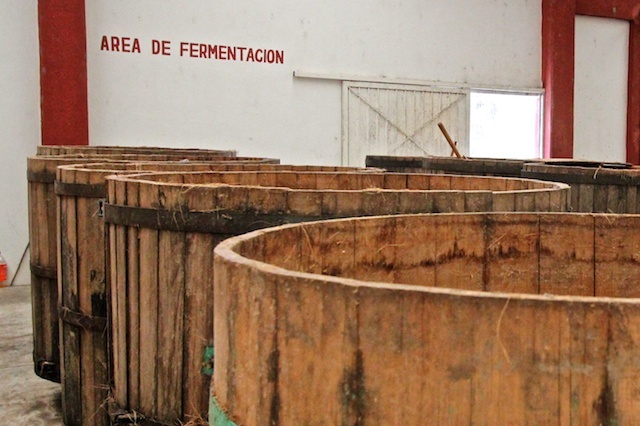 Fermentation for both expressions takes place in the twenty custom-built pine washbacks. 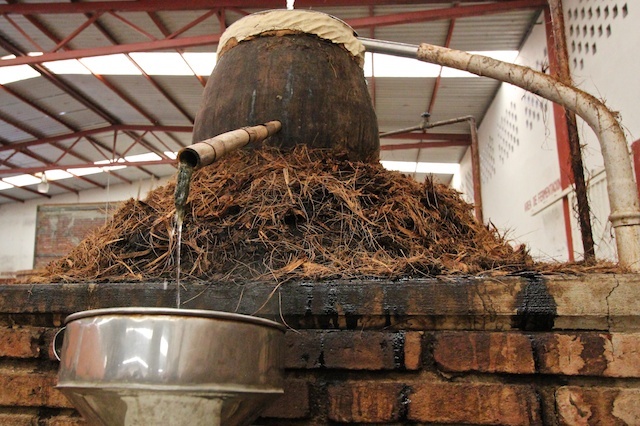 There are no chemicals added during the wholly-natural process, and no distiller's yeast is introduced to the pulque. Fermentation happens organically after about two days when the local strains of airborne yeast eventually find the sugary-sweet liquid and begin feasting upon its many delights. One part of the spirits process that I always have something to say about (although I've learned over the years to keep my mouth shut) is the label design and marketing aspect of each brand. 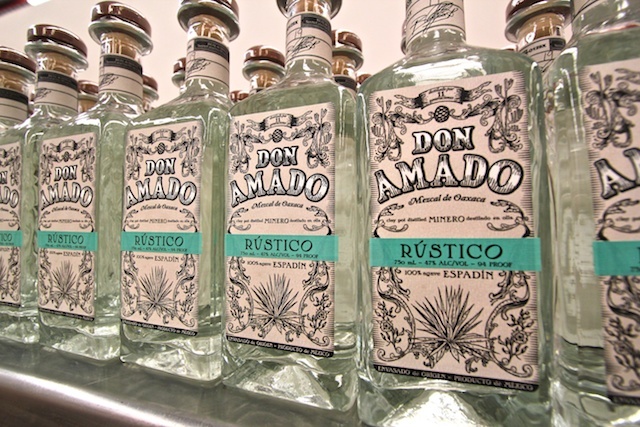 While I never really hated the original Don Amado label, I was thrilled when I saw the upgrade that Jake and Jose came up with recently. It's a huge improvement over the old package and I think will help sales immensely when the bottles reach the states later this year. All of the bottling is done on-site at the Real de Mina distillery, as is maturation for the reposado expressions in a small warehouse behind the bottling line. At the moment, I'm sitting on a plane typing away while we begin our descent back into Mexico City. We've got an hour to kill before we catch the connection to Guadalajara and begin our drive east towards Atotonilco and the hacienda of Enrique Fonseca. The food in Oaxaca has been so amazing that it requires its own separate post (which I'll have to work on later), but I'll be lucky if I can pump out a Tequila write-up before sundown.